What's not to like about running a restaurant? You're your own boss in a great little business. You lead a team creating something out of nothing, day after day. You mingle with people all evening. All this is true, but running a restaurant is not for everyone. Here are five common traits of successful restauranteurs. Many people who love to cook think they should open their own restaurants. Maybe they should if they like bookkeeping as well. 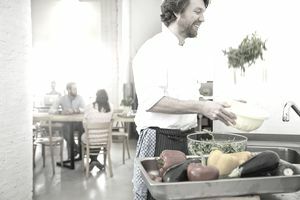 In order to succeed, a restaurant owner must stay on top of the business' bookkeeping, accounting, marketing, sales, and human resources issues. Some of these certainly can be outsourced. You can pay a bookkeeper to track the money, and you can hire a public relations person to handle the promotions. But that doesn't mean you can walk away from those tasks. You need to keep on top of all aspects of the business to make sure it's running smoothly. Unlike the stars you might see on Food Network, most restaurant owners don’t become overnight millionaire celebrities. Success comes with perseverance, which starts with patience. One of the reasons so many restaurants shut down a couple of years after opening is that their owners get tired of working long hours and not seeing big results. Ask any successful restaurateur what their early years were like, and they'll tell you about 80-hour weeks and unexpected setbacks. Building any new business into something solid and lasting takes time. No one is going to care about your restaurant as much as you do. That’s why you have to put your heart and soul into it to stay motivated when problems arise or business is slow. Not all people are cut out to run a business. Most find it harder to motivate themselves than to follow directions. And some people thrive on being in charge. That is what makes opening a restaurant an ideal career move for them. A restaurant owner is a jack-of-all-trades, and when problems arise they must be dealt with, even on a day off. It’s important that your family be okay with your long hours as well. It can be hard on a spouse and children. Before you open a restaurant, consider the impact your long work hours will have on your family. That said, many family-operated restaurants thrive for generations. If you're lucky enough to have family members who share your dream, you're off to a good start already. A restaurant falls into the hospitality business category. If you don’t like to interact with the public, this may not be the ideal job for you. A good restauranteur is a presence in the dining room, greeting customers and solving problems large and small. The best also take an active role in the community, representing the business in the outside world.